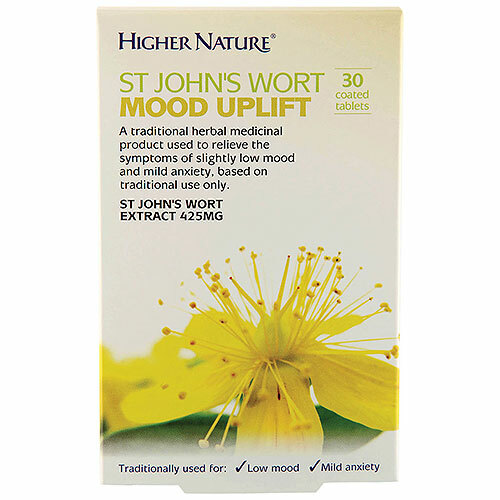 Higher Nature St John`s Wort Mood Uplift is a traditional herbal medicinal product used to relieve the symptoms of slightly low mood and mild anxiety, exclusively based upon long-standing use as a traditional remedy. There are a number of factors that can trigger low mood, such as bereavement, divorce, illness, redundancy or money and job worries. St John’s Wort Mood Uplift may support you through these sad times. St John’s Wort is named after the 24th day in June, St John’s day, when this popular medicinal herb typically starts flowering. In Medieval times, people hung St John’s Wort over pictures in the belief that it would ward off bad spirits. Today, St John’s Wort is used, especially during the long, dark winter months, to help keep the ‘winter blues’ at bay. These easy-to-swallow, one-a-day tablets are traditionally used to lift your mood. Maltodextrin, silica colloidal anhydrous, microcrystalline cellulose, croscarmellose sodium, sodium starch glycolate (Type A), magnesium stearate. Coating: Hypromellose, sucrose, talc, calcium carbonate E170, tragacanth, acacia, liquid glucose (dry substance), titanium dioxide E171, iron oxide hydrate E172 (yellow iron oxide), vanillin, beeswax white, carnauba wax, shellac. Adults and the elderly: For slightly low mood and mild anxiety take one tablet daily. The tablets should be swallowed whole with some water or other liquid. Do not chew the tablets. You must read the enclosed Patient Information Leaflet carefully before taking these tablets. You should see a doctor or healthcare practitioner if the symptoms persist while using Higher Nature St John`s Wort Mood Uplift or if side-effects not mentioned in the Patient Information Leaflet occur. Increased sensitivity of the skin to sunlight may occur in rare cases, especially in fair skinned people. Below are reviews of St Johns Wort Mood Uplift - 30 x 425mg Tablets by bodykind customers. If you have tried this product we'd love to hear what you think so please leave a review. 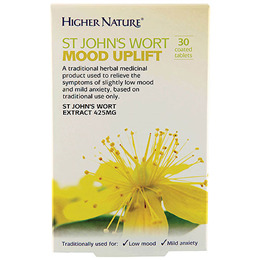 Higher Nature St John`s Wort Mood Uplift is a traditional herbal medicinal product used to relieve the symptoms of slightly low mood and mild anxiety.